Missguided Mommy started this game and I wanted to play along. 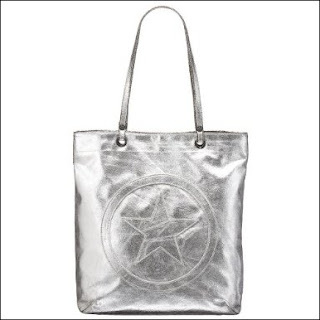 It's called, "What's in my bag"
Here's my bag: It's a Converse One Star tote bag I got at Target and it is HUGE. I also have one in black. This is actually the 2nd silver bag I've gone through. On the outside of my bag I have 2 keychains from the Philippines. One is the Philippine flag & the other is the bible verse 1 Corinthians 13:4 'Love is patient, Love is kind." Now inside... is my life... I'm not even kidding! 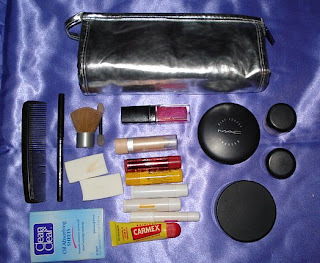 Bet you didn't think anyone could have so much stuff in their purse! Now I'm embarrassed, haha! What are we even looking at here? 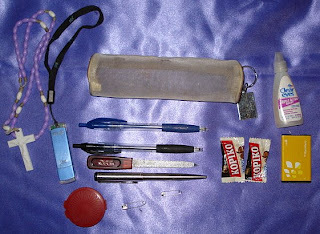 I try to keep things organized by putting some of my stuff into smaller bags, instead of everything inside my purse. There are 3. One is a silver makeup bag from Watson's drugstore in the Philippines. 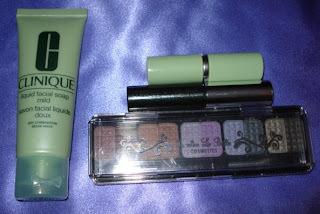 Another is green & white Clinique bag and the other a small grey mesh bag. I will go over what is inside them later. To the left: Pens, Makeup, My checkbook & calculator. To the right is my 80GB Video Ipod, Monkey Gloves, Hairbrush, Eyeglass cleaning cloth, my keyring with all of my keys, keychains & tags for stores. Down at the bottom is my real Louis Vuitton wallet (I got on ebay ages ago.) to the left of my wallet is Philippine & Hong Kong money... I don't know why I carry these in my wallet all the time along with my american money... but I do. Hehe. Such a mess. 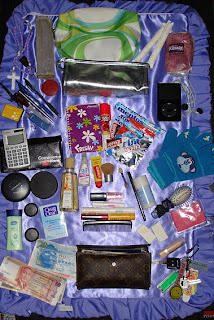 Let's look at what things look like when it's more organized in my bag. 6 Lip Balms (Carmex, Watson's Mint, Watson's Lemon, Watson's Tinted, Burts Bees, Dr. Pepper Bonne Belle. )I confess... I am addicted to lip balms! My hairbrush, Vaseline Lotion (Cool & Fresh), Bath & Bodyworks antibacterial hand gel (Honeysuckle). 1 1/2 Mentos Mints (addicted! ), Orbit Gum from the Philippines. A Cherry Push Pop because I was feeling nostalgic one day. 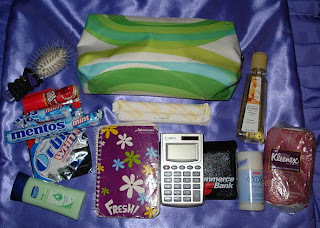 A little purple notebook I got in the Philippines, my checkbook & calculator, tampons & tissues. This great styling stick from Bench that I also got in the Philippines. Its keeps flyaway hair down. 1 backup Blackberry battery for my cell phone. With everything in my purse it's pretty heavy! I had the idea to weigh it and see how heavy it was on my postal scale. Since Misguided Mommy is doing a giveaway with her post, I am also going to do my first giveaway here on my blog! 1st Set is a Makeup Set. With 4 brand new items. 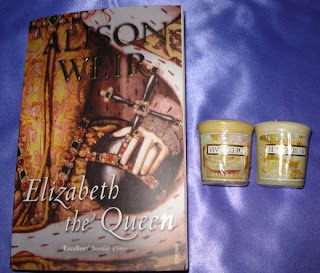 1 Book: Elizabeth The Queen by Alison Weir. 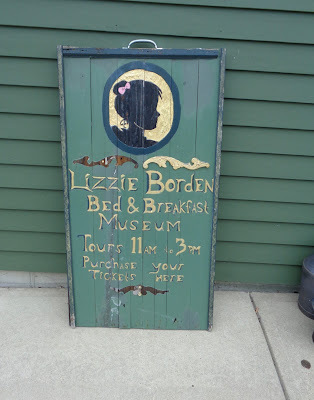 (Also titled as: The Life of Elizabeth I.) Non-Fiction, Paperback Biography. 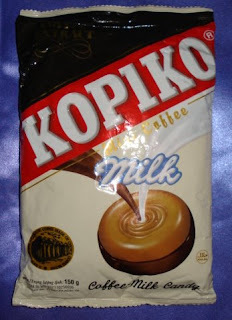 The winner will also receive with their prize a brand new bag of Kopiko Coffee Milk Candies, I brought back from the Philippines in December. They are amazing! If you play 'What's in my Bag' on your blog, leave a link in my comments!